Mid April 2016 I acquired a solar powered (0 gasoline or fuel, runs just on sunlight) truck. I'm documenting the whole experience here. The truck is named Martin (or Marty) after the name on the wooden keychain on the key for the truck (which was originally there as the name of the father of Karen who I bought Martin the truck from). Martin the truck is a Kei Truck size Mini Truck. It was manufactured by a company based in southern California called Dymac in 2008. The only information I can find about them is this autoblog article from 2008 and the archive of their website. Also, Karen provided me this incredibly janky copy of a news report she and the truck were in. The EValbum profile for the truck is here. ~ David Boyd and I driving to San Francisco from Mountain View. We barely made it. Dave pushed me and the truck over the top of this overpass because the truck had conked out on the way up. What a journey, what a photo. ~David unloading the plants we picked up for work. This was fun because we pulled right up to the door. The truck is so small and quiet I can sneak up right next to the bike rack. 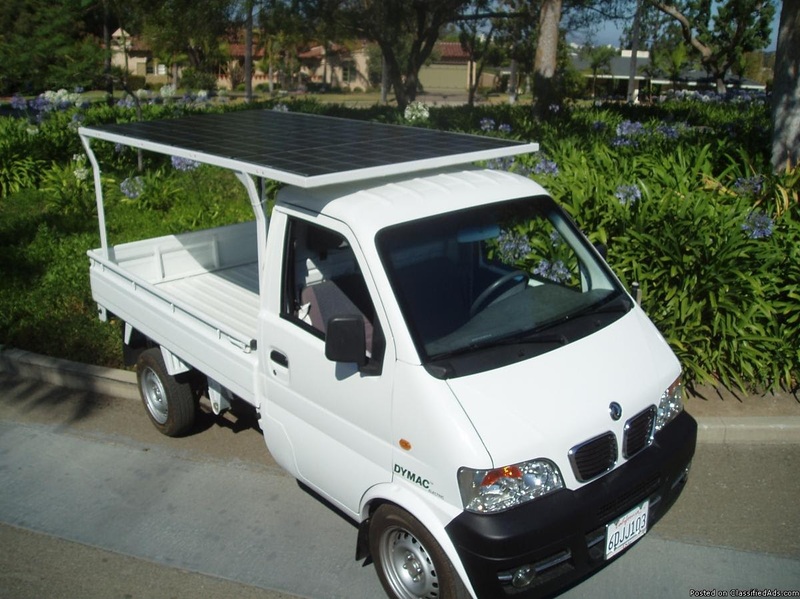 Solar powered transport is only cool (sustainable) if everyone has access to it. Otherwise it's just a smug way for me to get around. I really don't like having to tell interested people that it's extremely rare to find a truck like this. For a time I thought it was important for me to somehow help make green transportation like this available for the small niche of people it works extremely well for. But I don't really think my skills are a good match for this project. And, as it turns out, while Dymac is no longer around, there are a number of companies working on or currently producing solar vehicles. I've started to compile them here. Feel free to add more that you find.